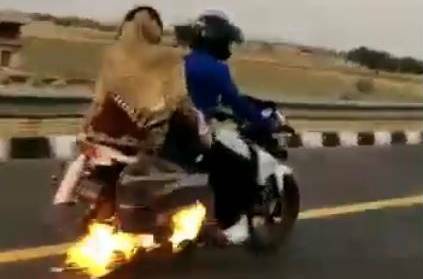 UP police on Monday saved two people from a major accident when they chased down a bike that had caught fire in Etawah. A bag attached to the bike caught fire on a highway. According to India Today, a police van noticed the fire when they came across the bike on national highway. Then the police turned on the siren and chased the bike. As they got near, a policeman from the van shouted to stop the bike and then helped to put out the fire. None of them were hurt in this incident which could have otherwise become a fatal accident. The whole incident was recorded by the police and they have shared it on their Twitter handle. This page contains news relating to various facts and events. The views are generally about current affiars and general topics in diversified areas such as political, international, national, and regional issues, sports, health, travel, lifestyle, technology and business. People having similar interets on the above topics will find this page useful. Watch Police chases down bike on fire, saves family! | India News.